Lovely Cottage That Is Completely New With All The Luxuries You Would Want! Great room with full kitchen. Gas fireplace. 2 master bedrooms with full bath. This cottage is a gem which is nestled on 3 sides by forest. It is completely renovated with all modern appliances. There are porches and decks on all sides. Two master bedrooms with large tiled showers. 12 minutes from Ellicottville & the ski slopes. There is a wonderful front porch that wraps around to a deck with a gas grill. 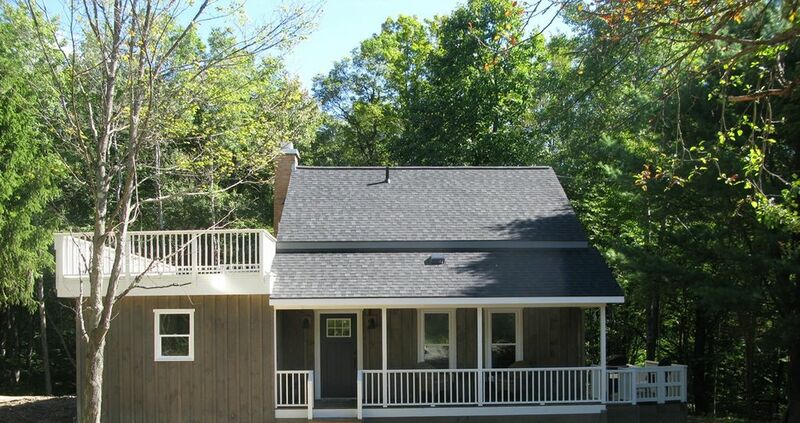 The entire back of the house is an amazing screened in porch which is right at the edge of the woods. So peaceful and beautiful. You look right into the woods! toilet, shower, This bathroom features a large walkin tiled shower. toilet, tub, shower, This bathroom features a tub & a large walk in tiled shower. The living room is all part of the great room which includes the kitchen and dining area. All very convenient and lovely. This is a fully equipped and brand new kitchen with all the appliances that one would need! The dining area is part of the kitchen and great room. Very comfortable and pretty. There is also a very large screened in porch that runs the entire length of the back of the house. This beautiful and fully equipped cottage is the perfect place for a getaway from the bustle of the city. It is surrounded on 3 sides by forest and is next to 2200 acres of NY state land. There are 2 master bedrooms with adjoining bathrooms. Our experience and stay at the cottage was top notch from our first inquiry to the morning we left. This is one of the most immaculately maintained cottages I've seen. The decor is absolutely beautiful with a mixture of the most up to date amenities and beautiful antiques. The location is secluded, peaceful and beautiful. Bette provides the best customer service possible. She's very quick to answer email and makes sure her guests are comfortable and settled in upon arrival. Our stay at the cottage was so wonderful that we chose to spend our entire time on site, never leaving to explore the town. I highly recommend Bette and the cottage for anyone looking to unplug. You do need to be ready to unplug as although the wifi works perfectly there is no cellular phone service. We had phones from 4 different service providers and none had service on the site. The cottage was thoughtfully equipped with high end furnishings and kitchen appliances. The outside deck on the 2nd floor offered amazing views of the night sky and sunshine during the day. The screened porch was perfect for late night conversations and early morning coffee. Everything about the place was first rate starting with Bette greeting us and touring us around the house to the comfort and details in each room of the cottage. We didn't want to leave!! We stayed for a week, as a family of six (2 adults and 4 children). It was just the right size for our family. We loved everything about the cabin. The bathrooms were great! The back patio was amazing. My kids had fun playing outside as well. Bette was a kind hostess. Thumbs up. Hi Christie.....thanks so much for your nice review. I am so glad that you enjoyed your stay and your girls did seem to have a wonderful time. I hope you can visit again sometime! This was our second time staying in Bette's cottage and we loved it even more this time. It is the most charming, lovely, secluded and beautifully appointed cottage ! It is just 15 min from the hill right in the heart of the woods and so quiet and peaceful. Everything about it is comfort. From the gorgeous rustic antique decor, to the fireplace to the cozy sitting areas and bedrooms............we never want to leave. Thank you Bette for being so accomodating and fun to work with. Oh and thanx for the snow !! We had the best ski week !! Warm, cosy and clean cottage in the woods. We had a great time. The location is private and pristine. We’ll definitely be back. Thank you Bette. Bette. We had a great time. The cottage was so clean and cozy. Two things you might take note of: the DVD player wasn't working and there are no instructions for the TV so we weren't able to figure it out. Also it seemed like the batteries for the fireplace operator might be low. Thanks again for a great weekend. We will definitely be back next winter! Hi Cara.....thanks for such a nice review. I also appreciate the update on the TV, etc and will look right into it so the next guests are able to have these things working!